The shape of the Bay creates a safe anchorage. 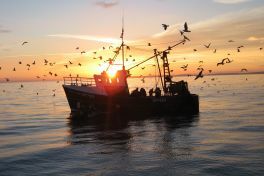 Firstly, this led to the development of the harbour at Brixham, which came at one time to be the largest fishing port in England. 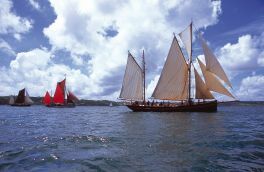 It was here that deep-sea trawling was pioneered in the UK and the maritime heritage of Brixham is therefore highly significant to the social and economic story of the Geopark. 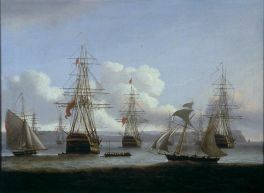 Secondly, it led to the use of the Bay by the naval fleet during times of crisis, prompting the construction of the Berry Head Forts during the Napoleonic Wars and stimulating the birth of Torquay as a Tourist resort - the families of naval officers came to settle in the town and word spread of its attractive setting and climate. At its greatest extent the Forts covered the majority of the headland, much of which was scheduled as an Ancient Monument as early as 1950, the schedule was further extended in 2000 (Berry Head Conservation Management (2007 - 2017) plan).